My recap of last week's ITF Grade 1 International Spring Championships looks back at Hurricane Tyra Black defending her title, and Canada's Liam Draxl winning his first title at that level. Although both were the top seeds, the finals were anything but predictable, with the two titles decided late in the third sets. See this article at the Tennis Recruiting Network for more, including the doubles championships. The Division III team rankings were released by the ITA on Thursday, with the Emory women staying at No. 1, but with a new team atop the men's rankings: Claremont-Mudd-Scripps. CMS defeated former No. 1 Chicago 6-3 late last month and also have posted wins over No. 10 Williams and No. 8 Middlebury. Bowdoin made a big move in the women's rankings after beating No. 8 Tufts and No. 7 Amherst. I'll be covering the Division III NCAA Championships this year, which are May 20-26 at Kalamazoo College. The host schools and cities for the next three years of men's and women's ITA National Team Indoor Championships were announced today. The Illinois women will host next year's event in Chicago, the 2021 tournament will be hosted by the University of Washington women and the 2022 women's tournament will return to the University of Wisconsin campus in Madison. The same three cities will host the men's tournaments, in a different sequence. Wisconsin will host the Indoor next year, followed by Illinois in 2021 and Washington in 2022. See this ITA article for more details on the events' next three years. 2018 Vanderbilt graduate Astra Sharma has reached the semifinals of the WTA International tournament in Colombia, beating former WTA No. 5 Sara Errani, a lucky loser, 6-1, 7-5. Sharma, who hadn't reached a WTA quarterfinal until yesterday, will play No. 11 seed Lara Arruabarrena of Spain Saturday. For more on Sharma's win today, see the WTA website. No. 6 seed Amanda Anisimova is also through to the semifinals, after defeating fellow 17-year-old Maria Osorio Serrano of Colombia 6-2, 1-6, 6-3. Anisimova had not dropped a set to the wild card in three previous meetings in juniors, all on clay, but this match was tougher, with Anisimova required nearly two hours to record the win. Anisimova plays qualifier Beatriz Haddad Maia of Brazil next. At the WTA International tournament in Switzerland, Iga Swiatek of Poland, also 17, has advanced to her first WTA semifinal, beating Vera Lapko of Belarus 4-6, 6-4, 6-1. The reigning Wimbledon girls champion will face unseeded Kristyna Pliskova of the Czech Republic Saturday. Pliskova won the Wimbledon girls title back in 2010. 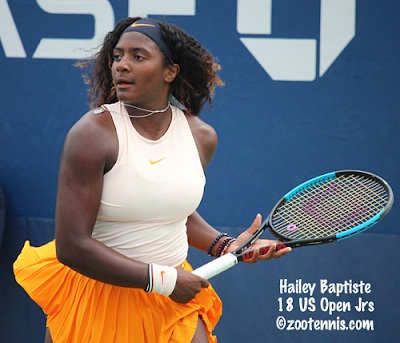 Qualifier Hailey Baptiste defeated No. 3 seed Karumi Nara of Japan 6-1, 6-1 today to advance to the semifinals of the $25,000 ITF World Tennis Tour event in Pelham Alabama. The 17-year-old Baptiste, who won the last tournament she played, the $25K in Plantation in January, will face No. 7 seed Barbora Krejcikova of the Czech Republic, who beat Ann Li 7-6(3), 6-3. No. 2 seed Caroline Dolehide will play No. 4 seed Sesil Karatantcheva of Bulgaria in the other semifinal. No. 8 seed Sebastian Korda didn't have to play a point to advance to the semifinals at the $15K in Sunrise Florida, with the 18-year-old getting a walkover from No. 4 seed Sekou Bangoura(Florida). He will play No. 2 seed Alejandro Gonzalez of Colombia in the bottom half semifinal, while Alexander Ritschard(Virginia) will play unseeded Dmitry Popko of Kazakhstan in the top half semifinal.